Flames Beyond Gettysburg: The Confederate Expedition to the Susquehanna River, June 1863", by Scott Leroy Mingus, Sr.  Much detail is given regarding defenses against Confederate incursions toward the Susquehanna River and Gettysburg, including information on the plans and actions of Maj. Gen. Darius Nash Couch. Discovered two species: Couch's Kingbird & Couch's Spadefoot Toad. Burial: Mount Pleasant Cemetery, Taunton, Bristol County, Mass. This is for all of you who are wondering if you are related to Darius Nash Couch. Darius was b NY 1822 to Jonathan Couch and Betsey (Hall) Penney. Jonathan was b CT 1777 to Thomas III and Sarah Nash. Thomas III was b CT 1751 to Thomas II and Elizabeth Jesup. Thomas II was b CT 1725 to Thomas I and Sarah (Allen) Keeler. Thomas I was b CT 1695 to Simon II and Abigail Sturges. Simon II was b CT ? to Simon I and Mary Andrews. 1. Leonard Crocker Couch b 1856. Last I heard, a woman in CT was writing a book on Darius Couch. She gave me some of this information. Pre-War Profession: Graduated USMA 1846 (13th of 59) with Army service in the Mexican and Seminole wars. Noted naturalist and later manufacturer. In June 1861 made Col. of the 7th Massachusetts Regiment. In May 1861 appointed BGen and commanded 1st Division of the IV Corps in Peninsula and Seven Days campaigns. Promoted to MGen in July 62. In command of the 1st Division/ Fourth (IV) Corps, but was on something of a wild goose chase toward and back from Harpers Ferry all day on September 17th. His division was not engaged at Antietam. He commanded Second (II) Corps at Fredericksburg and Chancellorsville, and then applied for relief of duty. He commanded Pennsylvania militia in the Gettysburg campaign, and led the 2nd Division/XXIII Corps during the Nashville and Carolinas campaigns. Lt. Darius Nash Couch (1822-1897) was on a leave of absence in 1853-54 to collect birds in Mexico for the Smithsonian when he found the oriole. It was later learned the bird had actually been discovered 17 years earlier by Bonaparte, however, the common name was retained. Couch did find a new toad and a kingbird which Spencer Baird named in his honor. Couch later distinguished himself in the Civil War, rising to the rank of General. 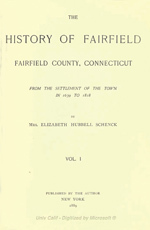 [S18818] The History of Fairfield, CT v.1 1700-1800, 373. [S18905] Flames Beyond Gettysburg, Scott L. Mingus, Sr., (Savas Beatie LLC, New York, NY), ISBN 978-1-611210-72-9..